No, I didn’t buy it, but only because I have my eye on something better. I’m back in Paris. Today I went to look at some furniture, lovely modern designer stuff, that will be auctioned off tomorrow. 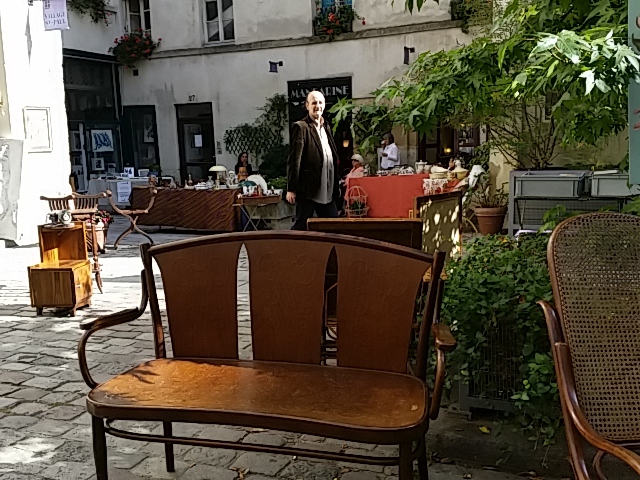 The auctioneer’s showroom was in the haut Marais, a neighborhood of narrow streets and medieval buildings that is quickly filling with galleries and fancy restaurants. Well, I have no problem with gentrification and the more time I spend in the Marais, the better I like it. So, why not, I looked through the furniture, registered for the auction and went for a stroll. Some 20 minutes later, I hit the jackpot: a brocante in the Village Saint Paul area. The area is well known for its antique shops. They were all open and the courtyards were filled with temporary dealer setups. I was surprised by how little interest I had in the very decent items on display. Back in my San Francisco life I loved the Hillsborough show. The only downside to moving in with Robert was giving up my Victorian flat for a midcentury modern house. After all, why would anyone want anything made after WW2? Now that I’m here in the land of great old stuff, I just want Tom Dixon and Arne Jacobsen. In terms of furnishing my house, it remains to be seen how things will play out. In terms of my life, if my little house in the Marais Poitevin is eventually bookended by an apartment in the Marais de Paris, haut or otherwise, don’t be surprised. We have a bunch of midcentury modern stuff in our stone farmhouse. It works for us. I can’t wait to see your country place as it progresses. Thanks. I’m concerned that all those low-slung horizontally-oriented pieces will look kind of odd in my high-ceilinged rooms, all axial and vertical, as they are. I’m not looking favorably at much else, though, so I’m just going to have to hope they balance out.